Boscolo New York Palace is located in a former palace that was renewed by architects M. Papiri and A. Tihany in 1894 and was carefully preserved in its original look. The pompous style of the palace is reflected not only in its architectural style but also in elegant décor materials that were brought directly from Italy. The refined style of inner premises features bronze statues, magnificent chandeliers made of Venetian glass, beautiful frescos by Gustav Mannheimer and Ferencz Eisenhut that decorate the ceilings, luxurious furniture, and silk wallpapers. The famous café of the hotel was once an iconic place that attracted numerous writers and artists of the city before the World War. Nowadays, the unique antique atmosphere of Boscolo will please fans of Italian luxury and high society setting. An old hotel with geothermal treatments, in 2013 Danubius Grand Hotel Margitsziget celebrated its 140th anniversary. The aristocratic hotel is located on Margitsziget Island in the middle of a picturesque park with centuries old trees, a Japanese garden, a rosary, and even an open air theater. The royal luxury and elegance together with respect for carefully preserved traditions attract numerous guests to the hotel. Travelers enjoy staying there in order to feel the charm and authentic atmosphere of the 19th century. From the historical point of view, Cotton House Hotel Budapest is a very interesting place. The hotel underwent its latest renovation in 2015. This is a truly charming place that would bring guests to the unforgettable atmosphere of the ‘20s of the previous century. Much time has passed since then, but designers managed to keep the original style and appeal of that time. The hotel features luxurious hardwood floors, elegant antique furniture, and some rooms come with the original ceiling décor. Vintage wallpapers, carpets with interesting patterns, elegant antique furniture and bright textiles only add that particular charm to rooms at this hotel. Another very beautiful historic building is currently known as Matus Hotel . The hotel is located not far from the city center, in the so-called “greenbelt” of Budapest. The hotel has only 9 rooms, each of which looks more like an exhibition hall of a historic museum rather than a guestroom. The rooms come with retro wallpapers, massive wooden furniture, and authentic paintings by famous Hungarian artists. Besides paintings, rooms and public zones feature skillful handmade decorative panels, antique carpets and clocks, charming chandeliers and table lamps. 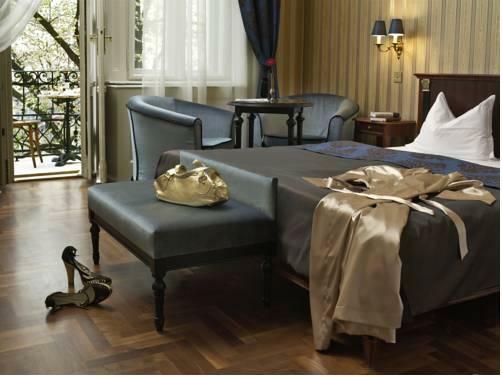 If you are interested in staying at a guesthouse, take a look at Gerlóczy Rooms de Lux . This popular accommodation is open in a historic building that dates back to 1892. The hotel was fully restored in a Bohemian style that is reminiscent of posh Parisian houses of the 19th century. The carefully preserved system of ceiling beams and arcs, chandeliers on massive chains, a rich variety of luxurious textiles of elegant colors and authentic antiques – a stay at such a hotel will never be forgotten. There is a great restaurant at Gerlóczy Rooms de Lux, the menu of which includes most popular dishes of the international cuisine. This guide to historical hotels of Budapest is protected by the copyright law. You can re-publish this content with mandatory attribution: direct and active hyperlink to www.orangesmile.com.